Welcome to the private boarding House 'Viktoriya'. 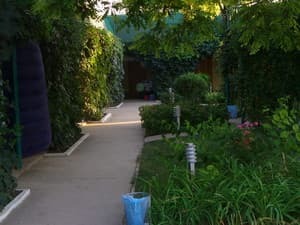 It is a cosy corner, which is situated in 15 km far from the Kerch city in a popular resort settlement Geroevskoe (Eltigen) on the shore of the Black sea. We have 15 rooms of economy class and 11 rooms of de luxe class available. 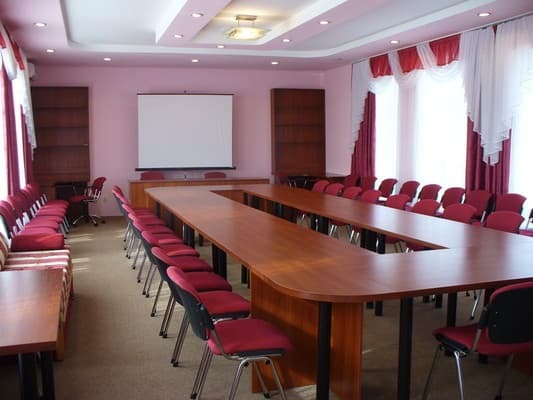 There is a modern conference hall (50 places) equipped for conduc of exit conferences and bussines meetings. The comfortable territory is enclosed and guarded round-the-clock. There is a free of charge car park, children's playground on the territory. We offer our guests meals in a spacious dining room. The distance to the sea shore is 200 metres, sandy, broad and clean beach. Supervision of qualified tutor will give You an additional opportunity to have a full-fledged rest. 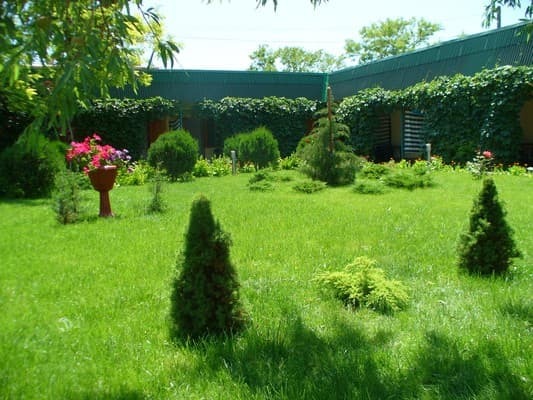 Warm-hearted atmosphere, attentive staff, home cuisine and sea medicinal air will allow You and Your relatives to have a real rest and to gain strength. If You like the sea and You want to enjoy the sun and quiet rest , we are ready to make your rest pleasant and comfortable! Have a rest there, where You are loved! 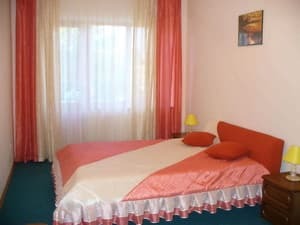 Description of the room: Class number "economy ", total area is ​​13 square metres, equipped with three (four) separate single beds, bedside tables, frefrigerator, TV-set. In the room there is a washbasin. Each room has a terrace, which is covered with wild grapes, which has a summer table and chairs. Bathroom, summer and hot showers, washing laundry are located on the territory. Description of the room: The suite consists of 2 rooms: a bedroom and living room. Quiet, spacious (the area of ​​each room is 18 square meters), harmoniously combines style with comfort of guest room and is equipped with comfortable modern furnishings, air conditioner, TV-set, refrigerator, set of necessary utensils, satellite television. The room is equipped with shower, WC. 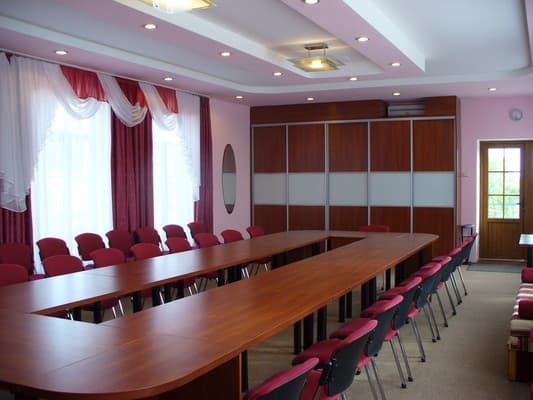 The room is suitable for 3-5 people. Rooms are cleaned daily. Change of linen is every three days. Hot water is round the clock. Rooms in the suite have access to a large balcony where there is old furniture. Discount for children's accommodation is not provided. Additional payment for residence when accommodating additional person in de luxe room is 10% of the room cost. 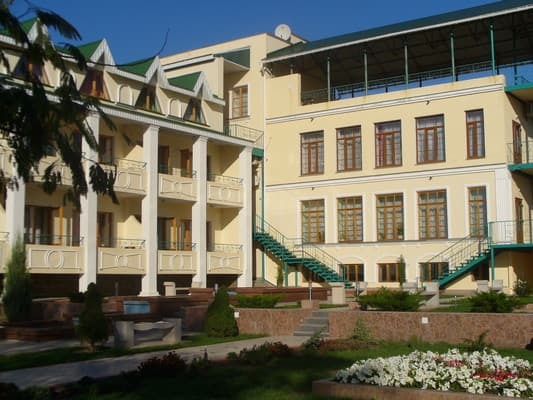 The private boarding house 'Viktoriya' is situated in 15 km far from the Kerch city, in a popular resort settlement Geroevskoe (Eltigen) and is 200 metres from the shore of the Black sea. You can get there from the bus ternminal, bus stop 'Kerch': by the route 5 to the bus stop 'Upravlenie JRK'. Further from the bus stop ' Upravlenie JRK' by the route 15 (works according to the schedule) to the bus stop 'Parus'. From the railway station 'Kerch': by the route 26 to the bus stop 'Upravlenie JRK'. Further by the route 15 (works according to the schedule) to the bus stop 'Parus'. At will of guests we provide transfer.